Dyson Ball Animal 2 Vs. Shark TruePet Upright Vacuum (Differences): Both Shark and Dyson have very capable uprights. Both provide the suction and powered brushroll to clean carpets of dust, dirt and pet hair. Both are not lightweight vacuums, but heavy duty, high powered cleaning machines. All Dyson and Shark uprights are Bagless, where you empty the dust bin into a trashcan, with some of the allergens getting into the air. Dyson’s power cord is 5 feet longer. 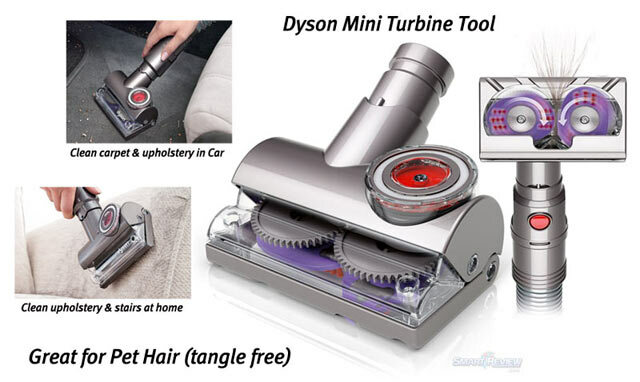 Dyson has a unique tangle-free turbine tool, which is great for pet hair. The Shark Lift-Away feature allows you to carry the vacuum around, while the Dyson uses a hose + wand. Dyson has a wider cleaner head than the Shark. The Dyson Animal 2 is more expensive than the Shark TruePet. What makes Dyson Unique- Main Differences: Dyson invented the cyclonic bagless vacuum, and has been an innovator in the bagless vacuum category. Dyson is also known for strong, powerful, suction. One area that Dyson stands out is its tools. One in particular is the Tangle-Free Pet Tubine Tool, which we believe is the best air driven tool for pet hair on the market. We have seen this tool demonstrated, and it can pick up long hair and even shoelaces without wrapping around the brushes. This model standard comes with Dyson Animal Corded Vacuums. What makes Shark Unique- Main Differences: Shark vacuums use a Lift-Away system, where the vacuum can be lifted off the body. Traditional vacuums like Dyson use a wand +hose off the main body. Shark has LED headlights in most of its higher end uprights.